In an age when so many record labels are on life support, it's inspiring to see some unsolicited exhibits of fan appreciation. Case in point: Drag City, record label to a litany of indie-folk types including Smog, Joanna Newsom, and no fewer than five Bonnie "Prince" Billy projects. 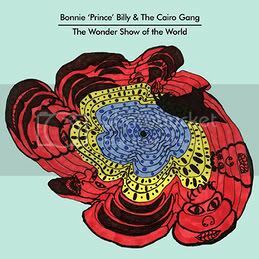 I ordered the new Bonnie "Prince" Billy (& the Cairo Gang) record, The Wonder Show of the World, in its CD form straight from Drag City's website. I received my order within a few days, but was a tad surprised by the size of the package. It was a large, flat cardboard box, suggesting they might have erroneously sent me the LP. Upon breaking into the cardboard, I was surprsied to find not only the CD, but also a 45 ("Midday"/"You Win") and a poster to boot. I always kinda figured the folks at Drag City were top notch, but their generosity made it official. I hereby endorse their label on behalf of HSW! It's worth noting that Lost Highway is capable of similar philanthropy. As a LH street teamer for some years, they sent me any number of handouts (CDs, records, posters, T-shirts), and even offered a parting gift of my choosing when I turned in my walking papers after some five years of service. In an age of struggle for the industry, these kind of gestures are not only refreshing, but its smart business.